In addition to the local jewelry markets, where hundreds of jewelry shops and stalls cluster, there are also regular wholesale or raw stone bazaars for jade in Tengchong, which is known as the Jade town of Yunnan province. Located near the border with Myanmar, Tengchong is a major processing center for jadeite, which is one of the two minerals recognized as jade, the other being nephrite. Nephrite is found in China. Jadeite, which is scarcer and thus more expensive, comes from Myanmar, with the most prized being the yellowish jadeite known as imperial jade. 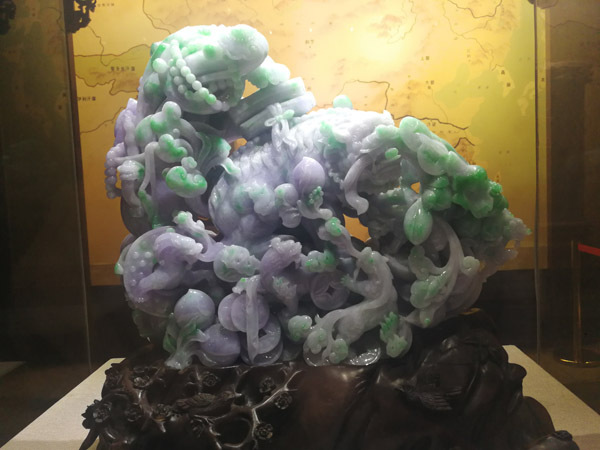 Tenchong's association with jadeite can be traced back about 600 years, according to Lu Dalin, curator of the Tengchong Jadeite Museum. Historical records such as the Travels of Xu Xiake indicate that Tengchong jadeite products enjoyed a very good reputation throughout Yunnan in the late Ming Dynasty (1368-1644), and they were highly sought after. "Tengchong's history and culture are closely related to jade. The jade trade has been here for hundreds of years," says Lu. The trade used to be a very prosperous industry in Tengchong, especially at the beginning of the 20th century, when a number of famous companies set up here because of the convenience of importing the jadeite from Myanmar and the booming international trade in its finished products. Cross-border trade started to take off again in the 1980s with China's reform and opening-up, and the jadeite trade has been one of the pillar industries for the city again since then. In 1998, about 70 percent of jadeite in China was processed here, Lu says.